This was delicious but quite unusual. I wasn't sure at the time that she quite convinced me that caraway is better than cinnamon in a carrot cake. However, the flavor really grew on me. I had a few technical issues. 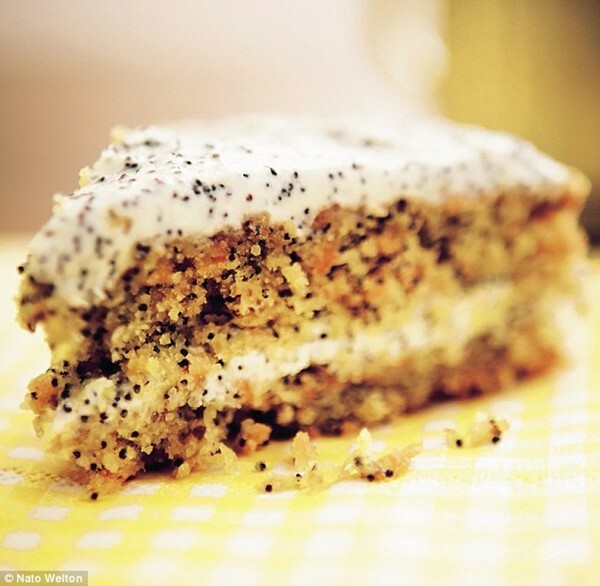 I loved the poppy seeds in the cake, but while really beautiful, they were less appealing in the frosting and I would omit the next time. I also thought the frosting needed more sugar (unusual for me)- maybe because my palate was unaccustomed to thinking of the caraway in that way and it read too savory? And although my cream cheese had softened for a considerable amount of time, it was very challenging to spread it on the delicate lower level of the cake- it definitely didn't "dollop" and she was concerned about liquid while I had none, so maybe there were product differences between the US/UK or my kitchen was just too cold? Finally, I had to add 15 minutes to the cooking time for my cake to bake through (I usually have to add 10 minutes to cakes because of my oven).